Kristen Stewart has lots of secret talents.. she can cook, can hit a golf ball perfectly and apparently can cook a great meal too. Her recent show off revealed her Shakespeare side and proved that she can do more than just act, (okay maybe the acting part is debatable), sharing a poetry in an interview with Marie Claire. It’s been a few years now since she burst on the screen as Bella in the mega-popular Twilight film trilogy and, although she hasn’t been seen all that much lately, you can expect to see the lovely Kristen back on movie screens during the summer of 2014. Kristen is also the new face of Chanel and Marie Claire’s cover girl this month. Meanwhile, she’s been kind of laying low, especially after that huge relationship mess with Robert Pattinson, which caused the breakup in 2012–part of the reason that she barely worked during 2013. During that time, aside from trying to win her ex back, she actually ended up taking a number of road trips with some old high school friends from back in Woodland Hills, California. At one point she even helped a friend of hers move down to New Orleans. 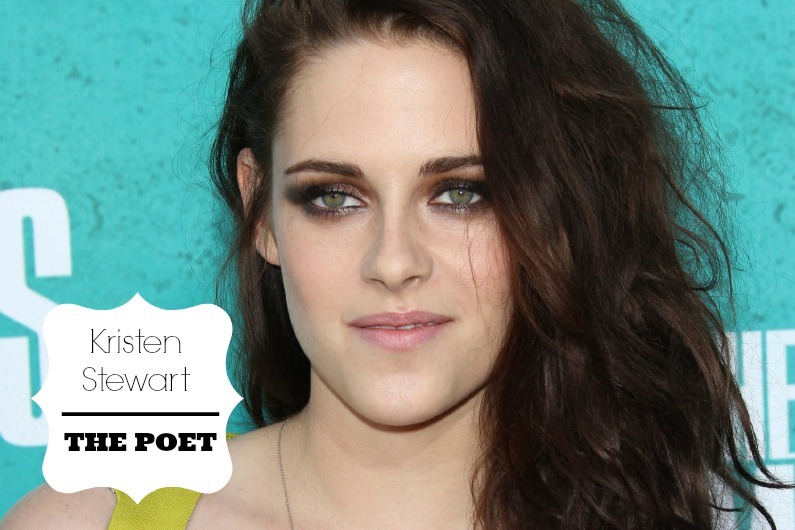 All that free time on the road needed to be filled with something and, during one of those trips, Stewart decided to try her hand at poetry, something that she says she now does from time to time to, as she says, “keep your sanity” . Below is one of the poems that she wrote while driving with a friend in Texas. Give it a read and see what you think about our Bella’s future as a poet.